This is a guest post from kosher vegan blogger and cookbook author, Rena Reich. After having many KOAB readers ask me specifically about vegan KLP recipes, I was thrilled when Rena offered to share her Vegan Meatballs recipe. I’ve been vegan for about 5 years now. I used to fear Passover, but not anymore. Over the years, I’ve compiled recipes to make the week go hunger-free for vegans and non-vegans alike. You can get my cookbook Vegan Start Passover Cookbook at VeganPassover.com. Meatballs are a fun food. They bring me back to my childhood. It was one of those special foods that my grandmother used to make. We lived in New York when I was little, but grandparents lived in Israel. They came for a few Passovers and I have very fond memories of us cooking together. These meatballs are very filling. The walnuts and mushrooms give a nice meaty taste. If you can’t get shitake mushrooms, you can use regular button mushrooms instead. Process mushrooms, walnuts, garlic and onion in a blender or food processor. Add spices and matzo meal and mix thoroughly. Roll mixture into small meatballs and fry in oil until all sides are browned. Once the meatballs have been cooked, you can serve them with practically any sauce. I’ve made them with creamy mushroom sauce, sweet and sour, and regular tomato sauce. Rena Reich runs ThePetWiki.com for living with animals, and VeganStart.com for eating without them. She grew up in Dallas, and now lives in Israel with her husband, three kids, three cats, two dogs and a very loud sun conure. Check out Rena’s Vegan Kosher for Passover e-Cookbook, Vegan Start — just $4.99. 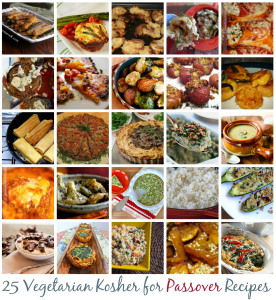 Still looking for more vegan or vegetarian Kosher for Passover recipes? Here are 25! I was thinking of making some sort of portobello-but mix but couldn’t figure out what to use for binding. I don’t see anything binding in your recipe. How do they stay together….or is it another miracle of Passover?! That sim hould say “portobello-nut”. Sorry! I had this tonight, whizzed everything in the food processor and recipe worked fine.